Dentures come in many different shapes and styles and are the most commonly used appliance to replace missing teeth. They can be used both as a temporary or permanent solution to a single missing tooth and for multiple missing teeth. You may have found yourself unwilling to smile in public or for a photograph. You may even be finding it difficult to eat with missing teeth. A well-fitting denture could solve all of these problems. 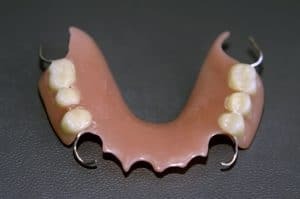 Acrylic dentures are mostly used when there are no natural teeth remaining. They tend to be both durable and attractive. Each acrylic denture is custom made in a 4 stage process, ensuring the best possible fit for each individual. Chrome cobalt dentures are an option for those with most natural teeth remaining and the need to replace only a few missing teeth. Chrome cobalt dentures use a metal-alloy framework surrounding the missing teeth this means that they maximise retention with a smaller surface area. Each chrome cobalt denture is bespoke and made using a 5stage process to ensure the best fit possible. Chrome cobalt dentures allow you to smile naturally again. Dental implant retained dentures are a great option for those with no natural teeth and those that do not get along well with an acrylic denture alone. Having the denture retained by dental implants means that there is much more stability for the denture and allows the denture to be fixed in place without the worry of the dentures becoming loose. Dental implant retained dentures are most commonly placed to stabilise dentures in the lower jaw but can also be used for both upper and lower together. Sometimes there is a possibility we may be able to adapt an existing acrylic denture to fix to the dental implant although often a new denture is required. The denture can be stabilised with as little as 2 dental implants in most cases.